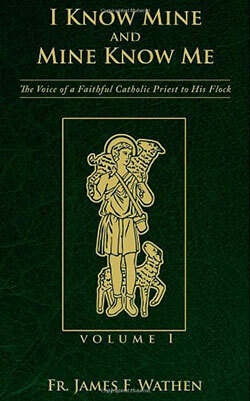 "During his final bout with leukemia, the heroic priest, Father James Wathen, still kept up his pastoral duties by way of writing detailed sermons and transmitting them to his followers, since he was not able to perform his priestly duties for them in a physical way. "We have collected these sermons, and have arranged them in book form to present them in a way that Catholics might enjoy. The sermons cover many subjects, and encompass over 600 pages between Volume 1 and Volume 2. In this book you'll find a short section that Fr Wathen wrote in response to the outrageous, defamatory and pretentious remarks written by Robert “Peter” Dimond and placed on the MHFM website concerning Fr Wathens book “Who Shall Ascend”, labeling him an apostate and a heretic. The video on the right was made during the time that Joseph Natale was alive. Father Wathen is being interviewed by Frederick "Michael" Dimond who was a simple layman (initiate) under the direction of the Joseph Natale. The subject of the interview concerns a few points raised in Fr Wathen's book "Who Shall Ascend". Please note that the quality of the image of this "1992" converted video degrades at 46:10 into the viewing but the audio remains in tact. First of all, I want to state that we do this only because it is necessary, and because Fr. Wathen has demonstrated for years an obstinate rejection of the truths that will be discussed. Various persons we know, including ourselves, have endeavored to charitably point out to Fr. Wathen where his position is mistaken regarding the Vatican II sect, yet he refuses to listen to the facts that are presented – year after year – and he continues to promote the same untenable ideas. You will discover by reading "Heresies of Fr. James Wathen" on the MHFM website that Robert "Peter" Dimond attacks Fr Wathen on various points that the MHFM never believed in at the time when the monastery's founder (Joseph Natale) was alive. Before the death of Joseph Natale, in 1995, Fr Wathen was invided on numerous occasions to come to the "original" MHFM located in Berlin, New Jersy, and to lecture / speak on matters that Joseph Natale firmly believed in, supported and taught. Yet, after Joseph's death, Frederick "Michael" Dimond usurped control over the monastery and changed it's longterm position on certain matters of Catholic faith and doctrine. In an attempt to justify those "new" beliefs contradicted Joseph Natale's he set out to discredit Fr Wathen a heretic and an apostate. And why did he do so? Simply put, The Dimond brothers saw Fr Wathen as "the competition" within their "business of religion". They call themselves “Brothers”, but neither of them has made the standard novitiate, which the Code says is strictly necessary for professed religious. They call themselves “Brothers” because this lends prestige to their opinions. The two brothers do not pretend to live a monastic life. Their vocation, as they see it, demands that they busy themselves in controversy. They think that the Church is better served by their spending their time producing various kinds of works of theological criticism, than in prayer and contemplation, which is the traditional obligation of monks. Neither of the brothers has had the opportunity for normal catechetical instruction, let alone theological training. They imagine that this does not matter, and it does not to the uninstructed. To those of us who have “taken all the courses” their inadequacy is a glaring reality. Like all other “sedevacantists” they have an appalling hatred of Pope John Paul II, as if he alone were the main cause of the Church’s present malaise. He is not. The Church’s present condition is due to the Great Conspiracy, the World Revolution, about which we have been warned by popes of former times and by Christ, Our Lady, and other messengers from Heaven. This Conspiracy has filled the offices of the Church with its agents, all of whom are bent on converting it into the “religious“ arm of the One World Church. In order to get Pope John Paul out of his office, it is necessary, as they see it, to get him out of the Church. Any theological principle which prevents them from doing this must be ignored or denied, and anyone who does not see things their way is a “heretic”, a “schismatic”, or something of the sort. I did not see whether Brother Peter considers me in or outside the Church. The theological dogma which they find obstructive to their view of things is the indelible character of Baptism, which we are taught in the earliest years of our instruction. This indelible character signifies that he who has received it has been made an adoptive child of God, a member of the Mystical Body of Christ, and given a certain equality with Christ in the love of the Father (because he is a member of Christ). This adoption cannot be lost by any sin or renunciation; it remains for his eternal glory or shame. This is one of the chief lessons Our Lord taught us in the parable of the Prodigal Son. Certain texts of popes and saints seem to suggest that an individual can be expelled or can withdraw himself from the communion with the faithful. All baptized Catholics, whether they are clerics or lay people, can estrange themselves from God and Christ and their Holy Mother the Church by sin, including the sin of heresy (which is nothing more than a denial of doctrine), but they can never become “ex-Catholics”, so that they would lose the indelible mark of Baptism, and their status of adoptive children. I do not want to overlook the fact that there is nothing heretical in “Brother’s” list. It is surely not a heresy, nor an act of schism, to maintain that John Paul II is the true pope, even though a bad one, or to include his name in the Canon of the Mass. Neither is it heresy to say that “Once a Catholic, always a Catholic”. I think sedevacantists are inclined to think that it is grave heresy to disagree with them. I have repeated often enough that as Catholics and as human beings we have both the right and the obligation to judge the opinions, positions, and ideas of everyone else. Our life in this world consists in making judgements about other people – whether they can be trusted, whether they are telling the truth, whether they will repay us if we lend to them, etc. ; and to judge their opinions, whether they are true or false, right or wrong. As Catholics, we must always be wary of heresy from every quarter, including him who sits in the Chair of Peter, as he is not personally infallible. The law of the Church forbids us to pass judgement on the status of the reigning pope, whether he is the pope, whether we are bound to obey him in all religious matters that are not contrary to the Faith. I trust it is not necessary to repeat that the pope is infallible in his teaching office, not in his governing office. This is why we do not have to accept the New Mass, because its issuance is part of the governing office (even though there is no law establishing it as a liturgy of the Roman Rite). Keep in mind also that there is a very great difference between the pope’s or any other cleric’s propounding erroneous views, which Pope John Paul does all the time, and their endeavoring to impose such views upon us as a matter of doctrine and salvation. Pope John Paul has never commanded us to believe any of his heretical opinions under pain of sin. Sedevacantists cannot comprehend this simple truth. Sedevacantists also have the idea that anything a legitimate pope teaches becomes a part of the “Sacred Magisterium”. This is entirely wrong. Only those teaching that which are conformable to the body of teaching which has accumulated through the years from the days of the Apostles, whose teaching we refer to as the “Deposit of Faith”, is part of the magisterium. Anything that is a variance therewith is not. The two “Brothers” Dimond are two worrisome little men. Without any authorization and without proper theological training, they have endeavored to establish themselves as teachers of the faithful and ‘certifiers’ of all priests in this country. They make a lot of money with their misleading publications, tapes, etc., and they spend much time on the phone persuading people to stay away from the Masses of non-Sedevacantist priests. Who knows how many Catholics of good will have been persuaded to stay home for months on end -- even years -- rather than attend Mass, confess their sins, and receive Holy Communion? I urge everyone to give these men a wide berth; do not buy or circulate their materials, even those which are acceptable. Do not send them money. Beware of wolves in monk’s habits.